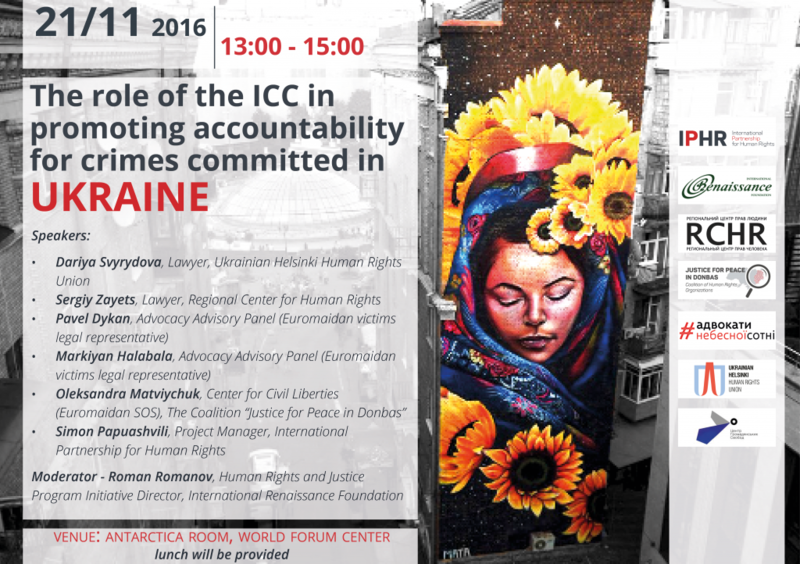 On 21 November 2016, an event will be organized in The Hague to discuss the role of the International Criminal Court (ICC) in promoting accountability for gross abuses perpetrated in the context of armed conflict in eastern Ukraine. Given the difficulties in ensuring accountability for such abuses at the national level, International Partnership for Human Rights (IPHR) and its Ukrainian partners have turned to the ICC. Based on their on-the-ground monitoring, they have shared evidence with the Office of the Prosecutor of the ICC in the hope that the Court will act upon this information, open an investigation and break the cycle of impunity that up to now has persisted in the region. Speakers at the event will include representatives of IPHR and a number of Ukrainian NGOs. See more information in the invitation below! Check out the Facebook event page here.